Of course, not all embryos are going to be Grade A embryos – and many women get upset when they find their embryos are Grade B or Grade C. They are worried that these embryos will result in abnormal babies . Please remember that embryo grades are simply medical shorthand , which helps doctors and embryologists to communicate with each other regarding embryo quality . An embryo is graded as Grade A when all the cells are equal and there are no fragments. If it has more than 10% fragments or if the cells are unequal, it is called Grade B. It is true that a Grade A has a better chance of implanting and becoming a baby as compared to a Grade B embryo. Thus , if the implantation rate of Grade A embryos in a good clinic is about 20%, for Grade B embryos it will be about 15%. However, if the embryo does implant, the baby will be completely normal. The fact is that it's impossible for doctors to accurately predict which embryos will implant and which will fail to do so. There’s no reason to get disheartened even if all your embryos are of poor quality . While this does reduce your chances of success, remember that embryos are living organisms, which do have the ability to self-correct. All embryologists have seen embryos which were 6-cell and Grade B on Day 3 turn into gorgeous blastocysts by Day 5 ! When there are lots of embryos, and the doctor has a choice as to which embryos to transfer, he will obviously select the Grade A embryos as compared to the Grade B embryos. However, not all Grade A embryos become babies – and many Grade B embryos do become Grade A babies ! Also, if you do miscarry after the transfer of Grade B embryos, this does not mean that it was the quality of the embryos which caused the miscarriage. The fact that the embryos did implant means they were of good enough quality to grow and develop further in utero after the transfer ! It’s important to insist that the IVF lab provide you with photos of your embryos – even if they are Grade B. This will increase your confidence in the services provided by the lab , because it shows they are willing to be open and transparent. This information can be very valuable in case your cycle fails and you need to get a second opinion. 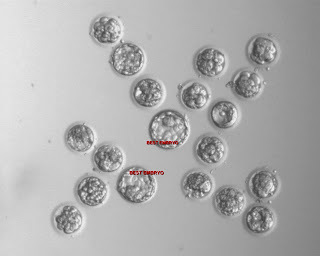 Every good IVF lab routinely and proactively provides patients with photos of their embryos. Sadly, we find that lots of IVF doctors use all kinds of specious reasons for not giving patients photos of their embryos. They claim that taking embryos out of the incubator will damage them ; or that the exposure to light when taking photos will harm the embryos. These are all useless excuses ; and should serve as a red flag that the doctor is trying to hide or cover up information. Need help is grading your embryos ? http://www.drmalpani.com/malpaniform.htm so I can guide you properly ! We do our best to keep our patients happy , and this is why we listen carefully to what patients have to say about their experience with other IVF clinics. There are three major complaints IVF patients have about IVF doctors . 1. 1. We do not get to see the Doctor. This is especially true when you take treatment in a large hospital , or an impersonal assembly line super-busy IVF clinic , where the doctor you see on a particular day will be the one who happens to be on duty on that particular day - the “doctor du jour” ! In many IVF clinics, the main “brand name” doctor himself is so busy that the only time patients get to see them is at the time of the first consultation. At this time, the clinic is in “sell mode”, and is trying its best to put on its best front, so that you will sign up for your IVF treatment with them. Once you have paid your money and started your treatment, you are forced to see assistants or juniors – and may never get to see the brand name doctor again. Patients are lured by the reputation of the “ famous doctor” – the one who is supposed to be the face, heart and brains of the clinic . When they pay a huge sum of money for their IVF treatment, and then find that they can never reach this Doctor to get their doubts clarified or their queries answered, they get very frustrated. They feel neglected and cheated because “their” Doctor is no longer approachable. They also find that they have to repeat their history over and over again for each new assistant, and this can be a painful exercise. Even worse, often the junior doctors will provide different answers to their questions, which means they are never sure what is happening to them. They start losing confidence every time they are fobbed off with the standard answer – We will ask the Doctor what to do – and then find that the Doctor is never available ! 3. 3. There is no transparency . IVF patients are so desperate to have a baby, that most of them will put up with these long waits and having to see a new doctor every time , without complaining. However, they feel very upset when no one bothers to tell them what is happening to them during their IVF cycle. No one is willing to take the time and trouble to sit down with them to explain to them how the cycle is progressing . Record keeping is very sketchy and most clinics don’t bother to provide even basic information as to the size and number of follicles seen on the scans ; or the number of eggs retrieved ; or the quality of the embryos . Most IVF clinics still don’t give patients photos of their embryos and this lack of what should be standard documentation is very worrisome. There often seems to be a conspiracy of silence – the standard answer to every question being – The Doctor will tell you ( and the Doctor is never available !) Sadly, most patients in India have been taught to be docile , patient and quiet – and they put up with whatever their Doctor dishes out - especially when this is a big brand name clinic. They feel that this is the standard of care – and since all the other patients are also being treated in exactly the same way , they don't have the guts or gumption to speak up and complain . Fortunately, times are changing , and especially when the IVF cycle fails , a lot of these patients wake up and start doing their homework , so they can find a better IVF clinic, which will engage with them and treat them with respect ! Looking for an IVF clinic which pampers its patients ? http://www.drmalpani.com/malpaniform.htm so I can guide you better ! “follies” ) and eggs . Doctors are sometimes responsible for this confusion , because we usually loosely refer to the follicles we see on your ultrasound scan as eggs. This is especially true during IUI cycles; or when the scans are being done by a sonographer or technician. When she sees that your ovaries have responded well to the superovulation, she will often say – Good, your eggs are growing well. In reality, eggs are microscopic structures which cannot be seen on ultrasound scans. 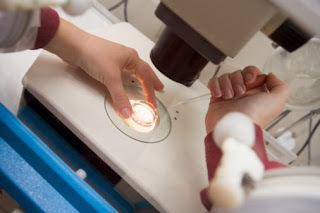 They are only 100 microns ( 0.1 mm) in size, and can only be seen by the embryologist in the IVF lab when he scans the follicular fluid the doctor sends him during the egg retrieval under the stereozoom microscope . Ultrasound scans allow us to track the growth of the follicles in your ovaries. Follicles are seen as tiny black bubbles on the scan, because they contain follicular fluid. They range in size from 4 mm – 25 mm; and the eggs grow within these follicles. However, not all follicles contain eggs , which is why the correlation between the number of follicles seen on the IVF ultrasound scans and the number of eggs which are actually retrieved is not perfect. When all the follicles grow at the same rate ( a synchronous cohort), then timing the HCG is much easier. However, often the growth is asynchronous; and some follicles may become big while the others remain small. It can be very difficult for the doctor to time the HCG in such patients. Thus, you may be disappointed when the doctor gets fewer eggs as compared to the number of follicles counted at the time of giving the HCG trigger. This is because some follicles are small and don't contain eggs ; while others are large , and have formed cysts which do not have an egg. It’s not possible to differentiate between a cyst and a large follicle based on the ultrasound scan images. It’s only after the doctor sends the follicle fluid to the embryologist in the IVF lab will we know whether there is an egg in it or not. Another possibility for not getting as many eggs as expected is that the doctor may have technical problems during egg retrieval , and may not be able to reach the follicle ( for example, when the patient is obese and the procedure is being done without general anesthesia) . Some doctors may not do a good job with aspirating each follicle, and may fail to collect the egg, because they do not flush the follicle completely and the egg remains stuck to the follicular wall ; or because there is too much blood; or because the embryologist may not be experienced at identifying the egg. This is especially true when there are only a few eggs; or if the doctor is not experienced; or if there are too many cases scheduled on that day and the doctor is in a hurry to complete your procedure. Sometimes, we may also get more eggs than the number of follicles counted on the scan. This is because doctors may not bother to diligently count all the follicles seen on the ultrasound scan ; or that some follicles are hiding behind the others , which is why they may not be seen during the scan. Even if the doctor does manage to retrieve all the eggs, do remember that not all the eggs will be mature ; and that not will fertilize . Because we are interested in the quality and the quantity of the eggs, we also track the blood levels of estradiol during the IVF cycle. Estradiol is not produced by the egg, but by the granulosa cells which line the follicle. As the follicle matures, it increases in size and the number of granulosa cells also increase, as a result of which the estradiol levels rise progressively. Estradiol levels help us to determine when the follicles are mature, so we can time the HCG trigger properly, and maximize the number of mature eggs we retrieve. While the correlation between estradiol levels and the number of mature eggs collected is quite good, it’s not always perfect. This is why IVF doctors need a lot of experience and expertise when interpreting these scans . This is especially true in older women; patients with PCOD; and those with poor ovarian reserve, as the margin for error in these patients is very thin. IVF in a large hospital or a free-standing clinic ? IVF patients are often not sure how to select an IVF clinic which is right for them . Since most medical procedures are carried out in hospitals , most IVF patients naively believe that the hospital setting is the best place in which to get their IVF treatment . Lots of hospitals do offer IVF treatment, and patients feel safe and secure in a hospital setting, because they believe that hospitals are well-equipped , and can handle any emergency , in case anything should go amiss during the treatment. Hospitals also have large advertising and marketing budgets , which is why they find it easy to attract patients . However , hospitals are not the best settings for providing IVF care – and most IVF treatment globally is offered in freestanding independent IVF clinics which provide specialized care on a day-care basis . The problem with hospitals is that they are large and impersonal ; full of red-tape ; and can be dangerous because they harbor antibiotic –resistant bacteria and lots of sick patients. IVF patients are not really patients – they are basically healthy couples , who just need little bit of help in order to kick-start their pregnancy. 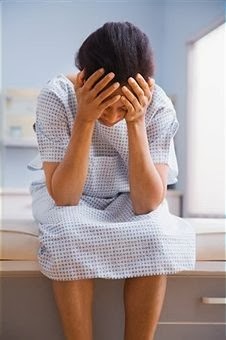 Being forced to wait with sick patients in a hospital environment can actually be dangerous , because of risk of medical errors and hospital acquired infections within this kind of setting is far more than it would be in an IVF clinic . IVF clinics are focused factories , which are designed to deal only with IVF patients . 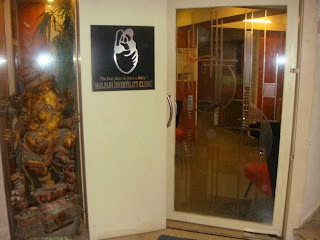 They provide all the services which an IVF patient needs under one roof. IVF clinics are much more cost effective and patient friendly. In a hospital setting, IVF patients are forced to deal with the hospital bureaucracy . They have to wait in line to pay their bills ; fill in their admission paperwork; and get a followup appointment. This can be extremely frustrating - and this is especially true when the IVF clinic in the hospital is part of an OB/GYN department , and the poor IVF patient is forced to sit in the same room with pregnant women . IVF clinics can offer much more personalized hands-on care, which is tailored efficiently to meet the specialized needs of IVF patients . The trouble is that not all IVF clinics have a good reputation ; and not all of them have the experience, expertise and the state-of-the-art equipment to provide good-quality care. This is why it's important for patients to do their homework ! Just because a clinic is situated in a hospital doesn't necessarily mean that it has the latest IVF equipment and facilities – and just because it is freestanding doesn't mean that it's not as well equipped as any clinic anywhere in the world . IVF technology is very specialized and focused , and most modern IVF clinics provide all the facilities and services which patients need. Need help in selecting the best IVF clinic ? I participated in the Aravind Eye Care Summit on Better Patient Compliance. They have uploaded the speaker presentations online. This allows you to listen to the recorded talks and download the presentations. It's important to improve patient compliance, and we should strive to spread this learning. Aravind wants you to keep this network alive - share your stories with this group. I re-read a humorous book titled “A Few Good Eggs: Two Chicks Dish on Overcoming the Insanity of Infertility”, written by Julie Vargo and Maureen Regan. As the title suggests, this is chick lit at its best for infertile women ! It takes a very refreshing light-hearted look at infertility. It has been written in a funny tone , and if you love humor, you will find this book interesting , as it will help you to tackle your infertility. Here are a few of the great tips this book offers . The biggest problem many infertile women face is dealing with the solitude caused by infertility. The world seems to be full of babies - and you suddenly feel very abandoned , since you don’t have a baby! People around you may be very unsympathetic and there may be no social support. The trick is to keep yourself engaged constructively, so you don’t start wallowing in self-pity. This can be a real challenge when people are inadvertently unkind or deliberately cruel . You need to learn to manage your temper and not lose your cool. This is a valuable life skill to learn – and there are many tools to help you do this – ranging from your mother’s wise advise to count to ten; to practicing vipassana. Remember that if an IVF treatment fails, this is not the end of the world , and it doesn’t mean that you are domed to be childless or that you are not capable of getting pregnant. There are several reasons why a single IVF cycle may fail - and patience is an important virtue all humans need to cultivate – especially if you are infertile . There’s no need to become an IVF specialist, but doing research about infertility will help you take control of your life ! This will help you stop feeling sorry for yourself. Humour is a very valuable antidote to many of life’s ills – and will help you cope better with your infertility blues. Reading this book will help ! Are you feeling depressed and sorry for yourself because your IVF cycle has failed ? Please send me your medical details by filling in the form at http://www.drmalpani.com/malpaniform.htm so I can help you to help yourself !